Breathtaking glaciers, fishing boats gliding along on pristine waters, meadows filled with wildflowers and the picturesque beauty of a historical Alaskan town nestled between two mountains. 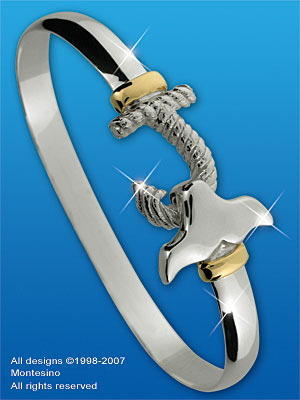 Juneau embodies the spirit of Southeast Alaska and the Juneau Destination BraceletTM is symbolic of that spirit. A rope "J" fashioned into a hook represents a nautical heritage and grasps a whale tail, a familiar sight in the waters around Juneau, and two14 karat gold wraps signifying Mt. Juneau and Mt. Roberts all together capture the spirit of this Alaskan port. Ride to the top of the tram, take a flight over the glacier fields and the Mendenhall, see the beguiling dance of the whales and remember the awesome beauty of this Alaskan town each time you glance at your wrist with the Juneau Destination BraceletTM... a true symbolic treasure.